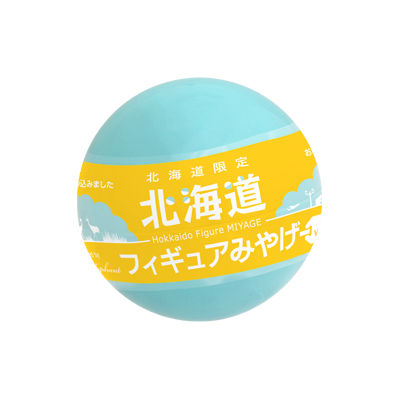 When you imagine Hokkaido, you may think about the scene of an open green stock farm where cows are grazing peacefully. Raw milk made in Hokkaido accounts for around 50 percents of all Japanese yields of milk. In a famous city as dairy, Betsukai, Hokkaido, the population is less than the number of cows. it's common for people living in the largest dairy region of Japan. Popular cows in Hokkaido are Holsteins. They, called the queen of cows, are used widely all over the world because they produce a huge amount of milk. This kind of cows is very suitable for natural features of Hokkaido because they have good resistance to cold. 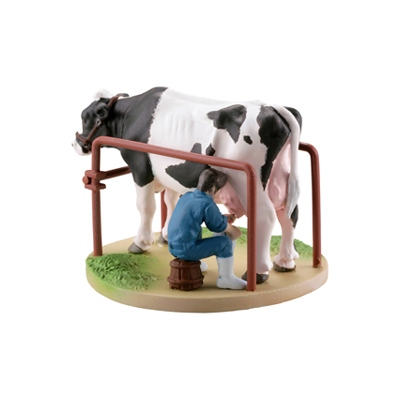 Only cows which experienced to breed can be milked, and after that they produce about 20-30 litters per day for 300 days. Everything including soft ice cream and that popular sweets of Hokkaido is the benefit from those cows and rich nature. Otaru is a port town facing Ishikari Bay. In Otaru where used to prosper in a herring fishery and trading port, there are many historical buildings. The nostalgic atmosphere is so favorable for tourists. Also, the big purpose to visit Otaru is "Sushi". 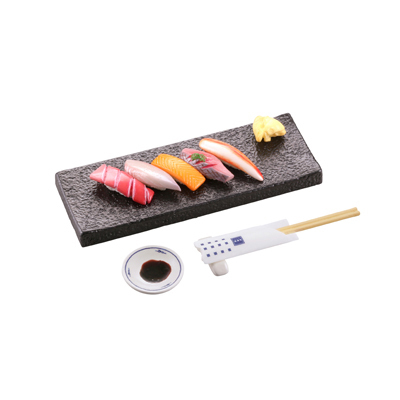 Now, there are over 100 Sushi restaurants. Around 20 sushi restaurants line the street called "Sushiya-dori". "Otaru Masazushi” (zushi means "Sushi") founded in 1938 is a restaurant at the street. With the words of a founder, Masanosuke Nakamura, that "we should appreciate not only guests, but also fishes" as starter, a festival to give thanks to fish was held. The fellow Sushi restaurants participating the festival were impressed by it, and they decided to spread Sushi of Otaru to all over Japan. The name of the street was named against “Ramen-yokocho” in Sapporo. Thanks to God of fish and the passion from Sushi restaurants, many tourists visit Otaru for Sushi. Everyone living in Hakodate knows "Lucky Pierrot". It's a popular local hamburger restaurant serving many unique hamburgers. 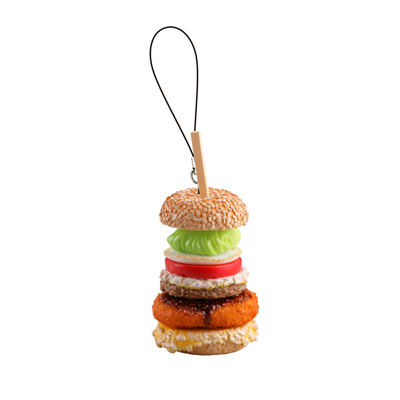 Among various kinds of burgers, the most outstanding one is "The Futoccho-Burger" limited to 20 burgers per day. It has 21 layers including lettuce, egg, tomato, croquette, pate, and sauce between buns. The height is about 8 inch. The performance is also unique. When it's served, a waiter brings it while ringing a bell, and if you eat it up, you can get a commendation. The important features of Lucky Pierrot are not only the unique appearance of its restaurant and the funny name, but also it has strong passion for Hokkaido and Hakodate, therefore it uses ingredients made in Hokkaido, and opened restaurants around in Hakodate. 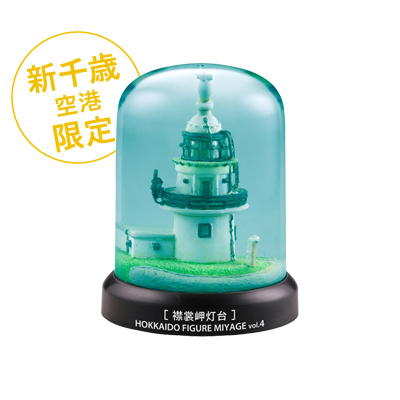 Those all features are the reason why tourist and Hakodate citizens have loved it for a long time. 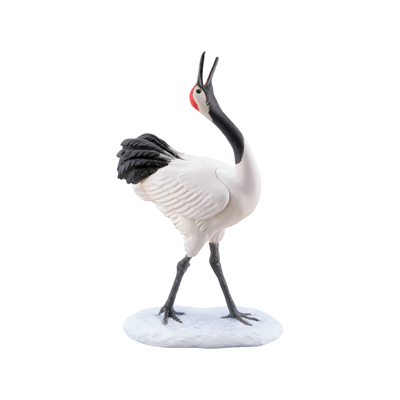 Red-crowned crane is known as one of the representative birds in Japan. Their habitats are only around Amur River and around the east Hokkaido, it's known as a rare kind of animals. It had been watched in many places of Japan in the distant past, but it was thought to be wiped out by indiscriminate hunting and development of marsh. But, after about 10 cranes were rediscovered in Kushiro Marsh in 1924, the number has recovered to over 1000 cranes because of the activity of protecting by local people and a protection organization. They live in the same place for a year or migrate a short distance in Hokkaido. They breed from spring to summer, in fall, they migrate to near town, and spend the winter. Around February, you can see a mating dance that they hop on the snow field while expanding their wings. They are also known as a lucky bird because a pair of crane live together till their death. If you’ve already visited Hokkaido, you might have saw a variety of crabs lining up in a market. 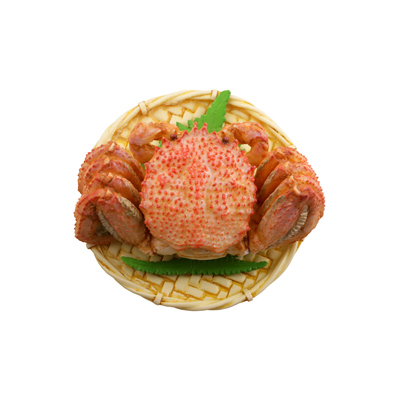 The most famous crab in Hokkaido is hair crab. Mainly, it inhabits at a depth of less than 150 meters of the Sea of Okhotsk and the Pacific Ocean. Even though the fishing season is different from each region, it is caught throughout the year in Hokkaido. In the fishing season, feed boxes are installed on the bottom of the ocean, and crabs lured into the trap are caught. All hair crabs sold at markets are male because female or small crabs are put back to the ocean for protection of resources. While now hair crabs are known as expensive ingredients, they were discarded in the prewar days because they interrupted other fishing. After the war, boiled hair crab caught at Funka Bay, sold at Osyamanbe station because of a shortage of food, won a reputation. This was an occasion to spread the taste of hair crab. The Ainu who is a Native Hokkaido had lived with nature for a long time. Almost all of place names derive from Ainu language. Ainu life was maintained by nature a lot. Ainu people harvested and caught an absolute minimum amount of plants and animals for food, and also used them for the necessities of life. They traded them with neighbors. Ainu village is called “Kotan”. The largest Ainu Kotan locating in “Akanko Onsen”, the hot spring resort of Lake Akan, is famous as a tourist site to enjoy Ainu culture and as a shopping street lined with many crafts shops of Ainu. 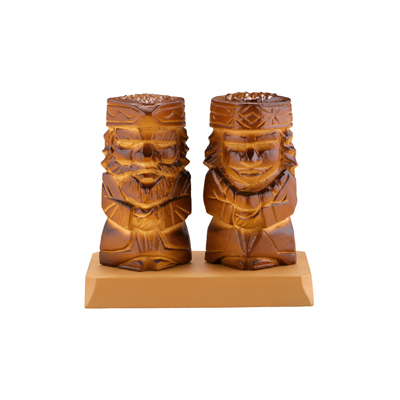 A popular souvenir of Ainu Kotan is wood carving product. It includes small good decorated with a traditional Ainu pattern and a wooden statue of husband and wife. Many artists create it, and each has unique atmosphere led by Ainu people who had lived with nature for a long time. Large rolls of hay tumbling over endless pasture and a big tractor, it's a representative scene of Hokkaido. The agricultural lands of farms in Hokkaido are vast, some 10 times larger than the national average, with many on par with the larger farms of Europe. That’s why many farms employ large-scale farming equipment, making huge tractors with more than 100 horsepower running over expansive farmland a common sight, albeit one unique to Hokkaido in Japan. Rolls of hay are produced from grass mowed with the tractor. The cut grass dried in the sun is gathered up and compressed into roll shaped bales using a roll baler pulled by the tractor. When a large and highly compressed roll has been formed, it is ejected from the roll baler as if it were laying an egg. 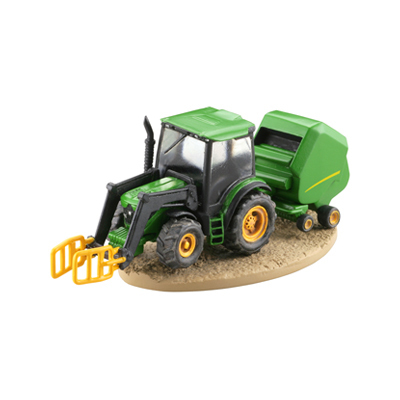 This model has been created based on the John Deere tractor, one of the main types of large tractors found in Hokkaido. Cape Erimo (Erimo-Misaki) is located at the southernmost tip of the Hidaka Mountains, a range of mountains around 2,000 meters high running from the center of Hokkaido to the south. It is the site of a dangerous stretch of sea, where a treacherous and rocky reef extends for several kilometers off sheer cliffs, the wind is strong and the tides fast. Standing as the symbol of Cape Erimo is a large, chalk white lighthouse that was first lit up in 1889. Its beams reach about 40km out to sea, and on account of the dense fog that tends to form in the area where the Oyashio Current and Kuroshio Current meet offshore, it is also equipped with a foghorn. It has watched out for the safety of vessels navigating through the area ever since. The desolate scene of a white lighthouse standing on the tip of a cliff captivates those who visit. The rocky reef-filled waters that extend below the lighthouse are also known as a habitat for harbor seals.